I’m back on the job and watching the second half of Gaim in a desperate bid to clean up some of my backlog. My post about the third Doctor is also coming along quite nicely and should be out within a week. But before I can continue with Gaim, let’s continue the tradition of interrupting the Kamen Rider season with a crossover movie of sorts. If you for a second think I’m joking with that title, I’m not. For obvious reasons I’ll be sticking with Kamen Rider Taisen, like normal people, but I just have to say that I love the little “feat. Super Sentai” in the end. Full disclosure, though the movie does feature Ressha Sentai ToQger (again, exactly how it’s spelled) I haven’t seen the series yet. That’s just the rub with deciding to watch series by series, rather than try some kind of mix between the two. I partially avoid that for the sake of these reviews, if I mixed series then I’d have a serious problem remembering what happened in each. I mention this whole thing about ToQger because there’s really two parts to this movie: the movie itself and Ressha Sentai ToQger vs. Kamen Rider Gaim: Spring Break Combined Special. 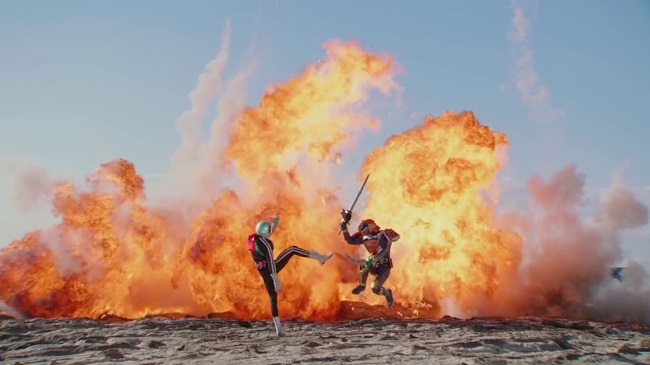 Or, more commonly referred to as ToQger vs Gaim… for obvious reasons. Normally around these movies, Toei does a bunch of advertising in the form of specials or webisodes. Essentially short clips that tie into the movie somehow that serves to explain past Kamen Riders, or parody them, and of course build hype for the movie. Typically, they don’t impact the movie itself much at all. They might explain details but they rarely contain any sensitive information. Not so with ToQger vs. Gaim as the special serves as a prequel or setup for the movie itself. And it’s actually quite funny. After my first exposure to ToQger in the Kyoryuger vs. GoBusters crossover movie I wasn’t particularly hyped about them but now I have a little more interest in them. I’m still not a particularly big fan of the suits but there you go, can’t have it all. Of course, if you want to give this special a miss, go right ahead. It doesn’t actually contain any super important information that you just have to know. But it does explain a few things and it’s a soft preparation for the movie itself, introducing some aspects that might otherwise seem a bit off. And I’ll talk about that soon too. But more than anything, I found the cast very endearing and ToQger’s Right and Gaim’s Kouta bounced off each other real well. They’re quite similar in a lot of way so it made for a very good pairing and the special is completely empty of the “mood” of Gaim so the humor and charm works here. I know this isn’t going to be everyone’s cup of tea but… screw it, it’s my blog and my review. So I’m gonna give this a thumbs up. We all need a little more joy and friendship in our lives anyway. Now! On to the main event! In this corner of confusing timelines and paradoxes: Showa Kamen Riders. In the other corner, weighing in at fifteen individuals and confusing status as alive: Heisei Kamen Riders! I want a dirty fight with lots of bad CGI! Let’s get ready to rumble! 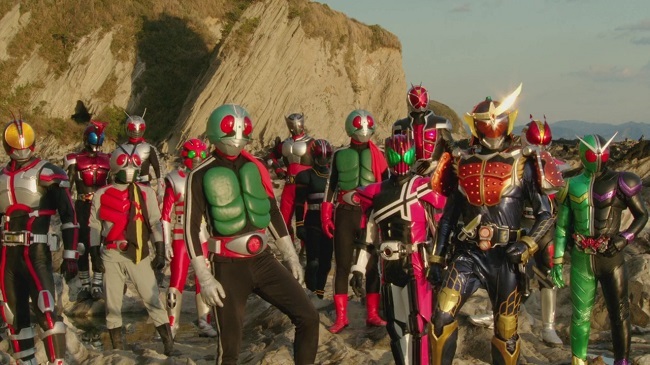 Kamen Rider Taisen is more or less exactly what it says on the tin: a great, big dust-up between riders of old and riders of new. You see, it’s the 15th anniversary since the revival of the Kamen Rider series, with Kuuga, and before that you also had fifteen riders so it works out quite well. 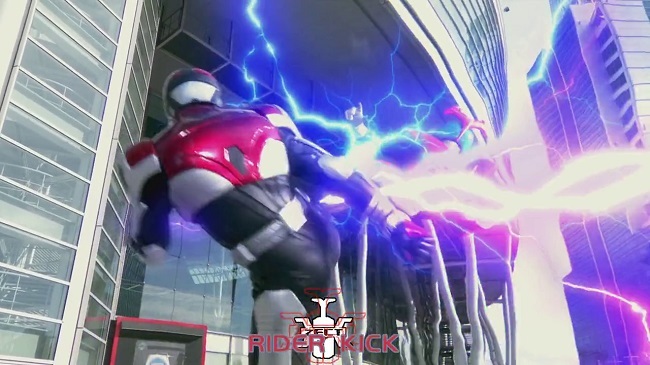 Each rider has someone to square off against even if some of them do seem a bit… uneven in terms of abilities. I mean, Kamen Rider J’s whole thing is that he grows huge. Doesn’t feel fair to have him fight someone like Kuuga… and then I’ll just leave unsaid who I think would win there. Obviously, before we get to the title fight, we have to have a bunch of smaller ones. So there’s a plot which revolves around the Underground Empire Badan coming to the surface in a bid to take over the world. And where there’s old, evil empires from shows of yesteryear, there’s inevitably Kadoya Tsukasa, the main character from Kamen Rider Decade. I’m not entirely sure what contract that man’s agent got for him but he must be set for life cause he’s in everything Kamen Rider for the last ten years or something. Decade indeed! Seeing something evil afoot, he recruits Kamen Rider Gaim’s Kazuraba Kouta, after he stumbles on the plot as well, to gather up all the Heisei riders and, if he can, the Showa riders as well. But as they’re soon to find out, the Showa riders don’t want anything to do with the new riders. In fact, they’d rather fight them and take out Badan themselves. If there’s one thing the Japanese aren’t very good at it, it’s communicating. Or, if you prefer to see it in a positive light, if there’s one thing the Japanese are very good at, it’s misunderstandings! Trust me, they’ve built entire series around that concept *coughFaizcough*. But I doubt there was really any other way to make this happen and it was something that was bound to happen eventually. I’m not gonna say people have been asking for it or anything but it was such an obvious concept, I’m kind of surprised it wasn’t done before. But then Kamen Rider has only recently been digging into their past to mine it for value so they’re still learning a thing or two. It started with a few cameos which resulted in movies more focused on it and now here we are, the logical conclusion to that train of thought. 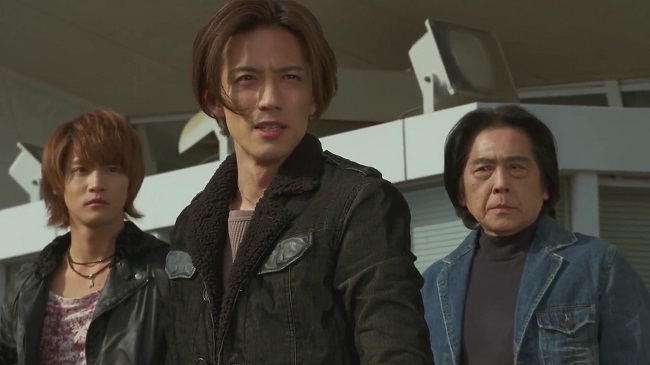 However, while I expected the typical fair of the old riders merely appearing in brief roles in big fights, voiced by some random actor, to my big surprise, multiple old riders actually do return: Sugata Shun returns as Murasame Ryo/Kamen Rider ZX, Hayami Ryo as Jin Keisuke/Kamen Rider X and friggin’ Fujioka Hiroshi as Hongo Takeshi/Kamen Rider (Ichigo). That’s right, the very first Kamen Rider is in this movie! That’s so cool! If you read my old reviews, you’ll know I’ve been asking for stuff like this for quite a while. 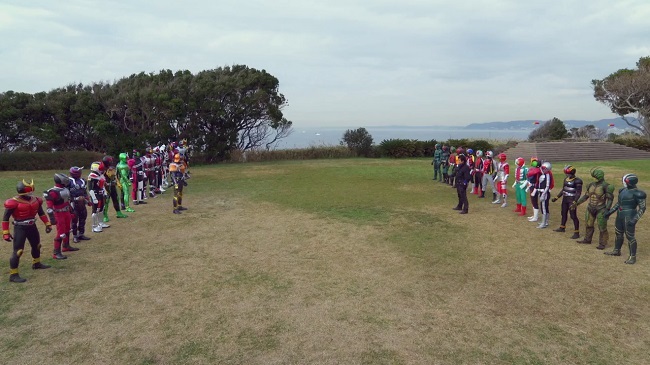 Gokaigers did quite well on their end most of the time but Kamen Rider has been quite… lazy. They’ve barely been able to bring back actors from as little as ten years ago, never mind more than three decades ago. Again, I know things work very differently there, with agencies and contracts and the like, but still, it should’ve been doable way earlier than this. Take the chance while some of the guys are still alive. I was doubly surprised then when they didn’t just bring back Inoue Masahiro as Kadoya Tsukasa/Kamen Rider Decade but also Handa Kento as Inui Takumi/Kamen Rider Faiz! Typically for movies like this, they get, at most, the two most recent riders and that’s about it. To actually rope in Handa for this was surprising to say the least. Considering his character should be bloody well dead by now. It’s… a Faiz thing. Some day… some day. Inui and Jin get a lot of time together, and we get to hear the woes of Inui and what he’s been up to since the end of Faiz. Or, well, AN ending to Faiz. Not the one I remember, that’s for sure. It’s very well acted for the most part, Inui was always a very reluctant hero so it makes sense that he’d struggle so much with what happened to him. I wish they did this a lot more with older characters and actors, bringing them back in for just a tv movie or special or something, letting us get a glimpse into their futures. If you can pair them up with another actor, like in this movie, then even better. Script it, shoot it, wrap it and put it out. And keep it out of movies like this. I know, SUPER WEIRD for me to complain about this but a movie like this is just too busy to take something like 20, 30 minutes off to talk about only two characters. They’re not that important to the plot itself even if they’re participants and though their time together does eventually lead to something important in the film, it doesn’t carry the weight it could’ve if this was a standalone movie or special, like ToQger vs Gaim. 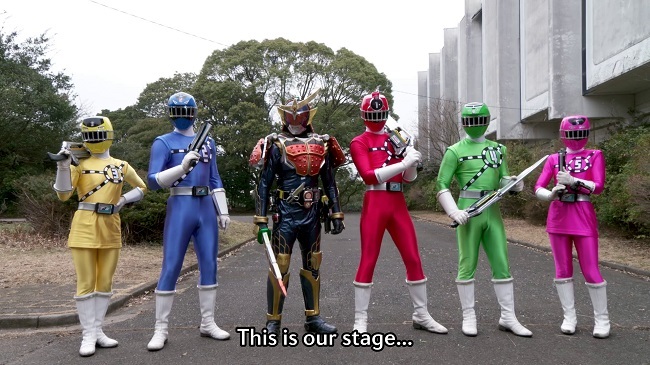 Super Sentai has started doing things similar to this, bringing back old teams (or at least huge chunks of them) and having them go on new adventures. Or, tie their stories up a lot more tightly. And it really works, it’s fun coming back to see them after all these years and what they’re doing with Tokusou Sentai Dekaranger is super exciting, in my opinion! Sure, I haven’t seen it yet but I WANT to. A lot. It could be terrible and I would still applaud them for doing this. I can’t wait to watch this! I don’t object to it being in a crossover movie, however, just… it needs to be tied in better if that’s the case. They already have the format perfect for this, they did it with ToQger vs Gaim. Just do that but Faiz vs X or something. It’d be brilliant and could cement the rift between Showa and Heisei riders even more. And it would allow you to return old villains at the same time, let them be a little more than background scenery in fights. Win-win for all! 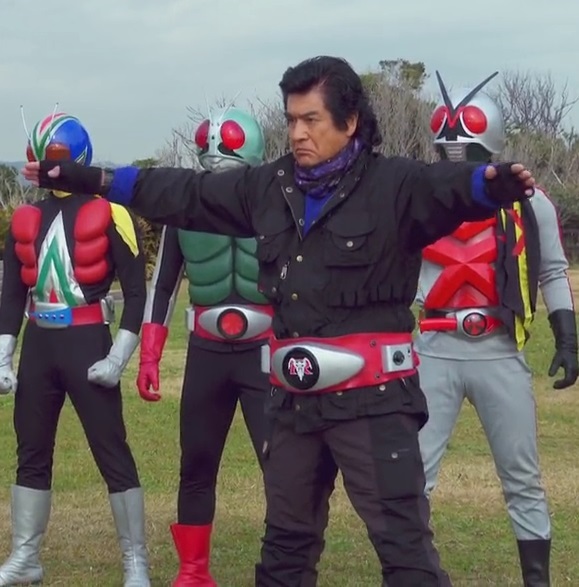 What I really liked about this movie, outside of all the things I’ve already said I liked, is that it really highlights just how different the two eras of riders are. The more modern riders are… well, exactly that. Their suits are busy and complicated, meant to convey a lot of themes and colors and ideas all at once. At least post-Den-O. But if you look at the old suits, they’re so… sleak. And minimal. Simple. Mostly the same basic look over and over again with some alterations. Not counting Stronger and Amazon, of course. And the same can be said about their styles. The new riders are loaded with weapons and abilities, gadgets and machines. The old riders mostly only have a motorcycle and their fists. The standard way of dispatching an enemy was with a kick or a punch, none of that nonsense with special moves. And whether you like this or not… well, that’s obviously up to you. I like the old, that’s hardly a secret, and I stick by that with a massive caveat. I wouldn’t want them to change the format, I like the stories and narratives of new. But I really do wish we could go back to more… martial arts, less CGI and gadgetry. Some new series do this better than others, it all comes down to the actor, I suspect. Some are way more athletic and nimble than others so it’s easier to have them do minor stunts and fights on their own. Sano Gaku, star of Kamen Rider Gaim, seems to be one actor who’s willing to be a bit more physical which is nice. Obviously there’s limits due to health and safety and stuff like that but still, it doesn’t hurt the show, that’s for sure. If there is one thing that I’m not very happy about, it’s the ending. On one hand, I’m glad that they actually decided to have it out for real and declare a winner. They don’t usually do that, they typically handwave the “vs.” part of the title away and say “It was a part of the plan, we don’t actually hate you.” They did it in Super Hero Taisen and it’s standard practice for every yearly crossover movie within franchises. And for a while it looked like that was exactly what they were going to do here as well. But, to my infinite surprise, the movie then does a complete turn and says “Ha, yes, it was part of the plan… but we also hate you.” and then proceed to have the riders beat each other up. And the victor!? Well… it depends? 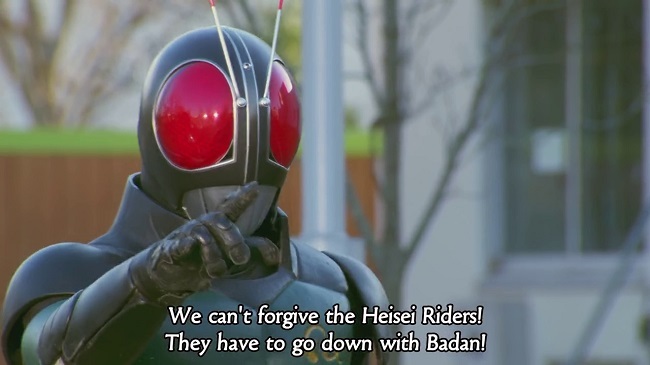 Officially, the Heisei riders win. 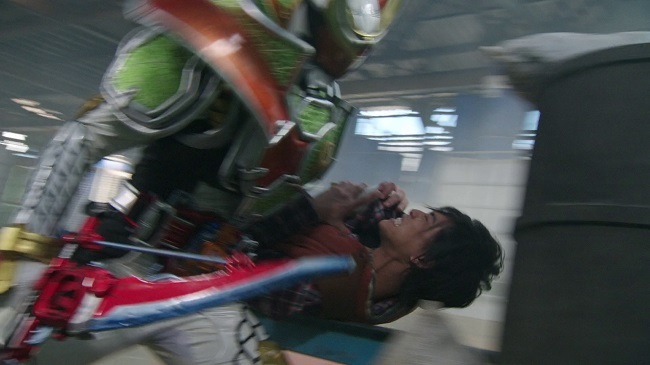 During the fight, Gaim takes a strike willingly in order to save a single flower, convincing Kamen Rider (Ichigo) that they might not be so bad after all. They then kiss and make up. At least in my head canon. Of course, if you don’t like that ending, you can actually watch another ending where the Showa riders win. Ichigo, instead of exploiting a weakness of Gaim, waits for Gaim to finish charging up, convincing Gaim that they might not be so bad after all. They then kiss and make up. Either way leads to kissing in my canon! The ending shown in cinema was chosen by the viewers by calling in and voting which side should win and Heisei won (big surprise there). But apparently it was a very small margin? But I still think it was a bit of a chicken move. Having the Showa riders win could show that the Heisei riders still have a lot to live up to. If the Heisei riders won it could show that Showa riders needn’t worry so much about the future, it’s in good hands. Neither side has to be shown to be the weaker just because they lose and it’s not like they couldn’t just reverse it in the next movie or something. They have to pick a winner in wrestling all the time and it’s not always the one people want to win. Yet somehow the show goes on. The same could be said here. They definitely tried to have it both ways when instead of one side losing, one side surrenders in a very dignified way, showing that both sides are okay. Come on, just have on side trounce the other already. It’s okay. We’ll survive, I promise. If this were a youtube video, I’d play a clip from the movie to tie together with my last sentence, play some inspirational and uplifting music and then ask “So, did I like it?” But since this is text, I’m asking you to picture it in your MIIIIIIINDS. Yes, just like that. Please like and subscribe and don’t forget to click the notifiy me-button. But did i like it? I… did. If you read any of my previous reviews of the so called “Movie War”-movies, you’ll know I’ve been pretty hard on them. Mostly because they haven’t exactly been stellar. I mean, they’re typically better than the usual Kamen Rider-movies which can easily be likened to bowel movements but that’s… obviously saying a lot. But this movie is a definite improvement by a huge margin, featuring such things as a coherent plot (mostly), good acting (mostly) and good effects (sometimes). And for once they actually had a payoff! The title wasn’t a complete lie! Whenever a Japanese movie puts “Vs.” in the title, I immediately become wary because they are pathologically incapable of just saying “These guys win, deal with it.” They absolutely refuse to piss off any one side and it’s so frustrating! But at least here they did have a good ol’ row of epic proportions and they sort of declared a winner so… go team? Regardless, it was a fun watch along the lines of “Let’s Go Kamen Riders”, a movie I utterly failed to review I realized only today, as I wrote it. Considering it’s probably my favorite Kamen Rider movie, that’s downright criminal. 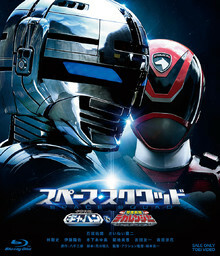 If you have any connection to Kamen Rider, especially the last fifteen, twenty years or so, then this movie is definitely for you. And for the rest of you… well, we all have to start somewhere.